Robotic fuel depots in space may be the best way to open up deep space for human exploration. Voyaging spaceships may soon be able to top off their fuel tanks in space, just as cars and trucks do here on Earth. Engineers at the Massachusetts Institute of Technology (MIT) in Boston are suggesting establishing off-Earth propellant depots to fuel future missions to the moon. Such en-route stations would mean spacecraft could launchwith less fuelon boardand hencecarryheavier loads, such as largerscientific experiments. Thelatest suggestion, however, is more cost-efficient, claims the team led by Jeffrey Hoffman, a professor in MIT’s Department of Aeronautics and Astronautics. Writing in the journal Acta Astronautica, the researchers suggest relying on so-called "contingency propellant" — backup fuelloaded onto spacecraft to use in an emergency. NASA's manned Apollo lunar missions carried it, and the idea was to either leave unused backup fuel on the moon or burn it in the atmosphere on the way back. The MIT team suggests two scenarios for putting contingency propellant to use. According to the first plan, called "steady state," a spacecraft would drop off backup fuel at a space depot during the return journey. The next mission would then pick it up as its own emergency fuel, and returnit if it didn'tuse it. To get the spare fuel, astronauts would have to go on a spacewalk, or transferitusinga robotic arm, similar to the Dextre robotic arm operating on the International Space Station. Dextre has already been used to successfully conduct a mock refueling mission aboard the ISS. Alternatively, fuel could simply be siphoned from tank to tank— a tricky solution, as liquids float in space, but still an option, Hoffman said. The second scenario suggests stockpiling the fuel. Each future spacecraft would continue carrying contingency propellant from Earth, always dropping if off at a spacedepot if it was unused. By continuously adding tothe fuel, the gas station could eventually accumulate a huge propellant supply, which could be ready to support a larger, more ambitious mission to the moon. "Whatever rockets you use, you’d like to take full advantage of your lifting capacity," Hoffman said. "Most of what we launch from the Earth is propellant. So whatever you can save, there’s that much more payload you can take with you." Keeping depots "stationary" at Lagrange points may be tricky, though. Another challenge is preventing cryogenic fuels, such as liquid hydrogen and oxygen, from warming up and boiling off while being stored, said Ian Crawford, professor of planetary science and astrobiology at Birkbeck College, University of London, who was not involved in the research. 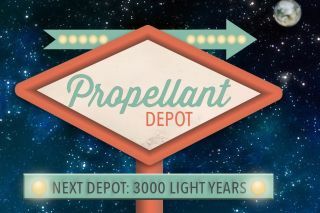 "This may require challenging thermal control for the depots, but if it can be mastered, this will have wide applications for future space exploration," Crawford told Space.com. "Anything which increases the efficiency of space exploration is to be welcomed." "And it is nice that the proposal will fit into the Global Exploration Roadmap concept," he added. The roadmap unites the interests of the European Space Agency and NASA, as well as the space agencies of Italy, France, Canada, Germany, India, Japan, South Korea, Ukraine, Russia and the United Kingdom. The group aims to co-operate to send robotic and human missions to the moon, asteroids, and Mars. The idea could also be used for longer missions to destinations such as Mars, researchers said. "This paper is extremely important and timely in the context of developing NASA plans for human exploration beyond low-Earth orbit," said James Head, a professor of geological sciences at Brown University who did not take part in the study either. The network of space gas stations could also give future lunar missions the extra fuel necessary to change orbit during the exploration of farther areas of the moon, say the proposal’s authors. And maybe in the very distant future, the space gas station attendant will clean your windshield, too. You can follow Katia Moskvitch on Twitter @SciTech_Cat. Follow us at @Spacedotcom. We're also on Facebook and Google+. Original article on Space.com.